In September 2015 The Tallis Scholars will reach a tremendously impressive milestone when they give their 2000th concert in London. Just as remarkable is the fact that all but a handful of those concerts have been directed by their founder, Peter Phillips. 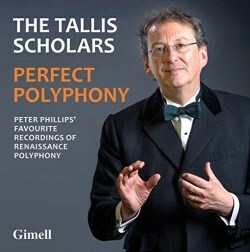 To mark the occasion Gimell has released this compilation of recordings, which is described as “Peter Phillips’ favourite recordings of Renaissance polyphony.” And since Phillips is the fons et origo of this remarkable – and remarkably consistent – vocal ensemble surely no one would begrudge him the right to make a personal selection from their recorded legacy to date. The reasons behind each individual selection, which Phillips sets out in an introductory note, are very interesting. The Palestrina Mass, for instance, earns its place by right: it was the very first piece that the group recorded, way back in 1977. They’ve made three commercial recordings of it – one of which was one of the very few live recordings by The Tallis Scholars (review). The one that’s included here is the most recent one, their second studio recording. The collection is “book-ended” by another Mass setting, this time by Josquin. It’s right that this should be included because the group achieved their great breakthrough, winning a Gramophone Record of the Year award in 1987, with a disc of Josquin Masses (review), though the recording of this particular one was made some years later (review). Most of these recordings have been reviewed already on MusicWeb International and the music will be familiar to many collectors so I’ll confine myself to a few comments on each. The Palestrina Mass is a composition of great significance and this recording, published in 2007, is extremely fine. The Kyrie sets the tone for what is to follow, not just in this performance but throughout the compilation. The blend of the ensemble is flawless and the listener gets a real sense of where each individual line is going and where it fits into the mix of the voices. In the Gloria the singers truly bring the music to life; particularly impressive is the energy and excitement in the closing section, from ‘Quoniam tu solus’. Even more thrilling is the conclusion of the Credo where the singing is marvellously fervent yet as well-controlled as ever. The group brings a timeless feel to the Agnus Dei. I previously reviewed this performance when it was included in the collection Sacred Music in the Renaissance Vol 3 and it’s a great pleasure to be reminded of its excellence. The Victoria and Gesualdo pieces are among the earliest recordings here. Both were issued in 1987 though they come from different sessions: the Gesualdo was set down in Salle while Victoria is the sole piece in this set that was recorded in St John’s Church, Hackney, a venue that the ensemble used a few times for recordings in the 1980s. Victoria’s Versa est luctum receives a suitably intense reading (review). The Gesualdo is a most interesting piece and Peter Phillips and his team do full justice to the composer’s very individual style. I’m delighted that a couple of pieces have been included from the very fine disc devoted to the music of Jean Mouton (review). These are among the most recent recordings featured in this present compilation. Full marks to Peter Phillips for not making the obvious selection: the wondrous Nesciens Mater. Instead he opts for two pieces that are nearly as fine. Salva nos, Domine is a beautifully proportioned piece. If anything, Ave Maria … virgo serena is finer still. This is a gorgeous Marian motet and the performance by The Tallis Scholars creates a wonderful atmosphere. If you haven’t heard the Mouton disc yet these two items should certainly whet your appetite. The Magnificat by Nicolas Gombert is one of eight settings that he composed. The Tallis Scholars recorded all of them on two separate CDs some years ago and by sheer coincidence the second instalment was, I think, the very first disc by them that I reviewed for MusicWeb International, back in 2002. All eight of the Magnificat settings were subsequently included in the collection Sacred Music in the Renaissance Vol. 3 (review). The first CD concludes with a magnificent example of the often-flamboyant music to be found in that notable collection, The Eton Choirbook. John Browne’s remarkable Stabat iuxta is scored for an unusual vocal line-up (TTTTBB). Though at times Browne fines down his music to just two lines, much of the music is very richly textured with the twelve singers delivering Browne’s intricate music in exciting fashion. This is a tremendous performance (review). composers on the same disc, one following another. That’s not the case, however. For one thing different vocal forces are used by each composer. Furthermore the settings by Brumel (ATTB) and Ferrabosco (SATTB) complement each other just as they complement the music of Tallis (SAATB). Not only is each composer’s music very different but also none of them sets the same verses of text. All the performances are immaculate. I was interested to learn from Peter Phillips’ note that the Brumel Lamentations were recorded on the spur of the moment to use up some spare session time: the singers sight-read the music as they recorded it. All of these sets of Lamentations can also be found in an earlier compilation: Sacred Music in the Renaissance Vol. 2 (review). One recording in this compilation was new to me: Optime pastor by Heinrich Isaac. What a discovery. The piece was written for a special and politically vital occasion: a meeting in December 1513 between Cardinal Lang, Chancellor to the Holy Roman Emperor, Maximilian I, and the newly elected Pope Leo X. Isaac was in the service of the Emperor and he seems to have pulled out all the stops to provide a spectacular piece for this important occasion. The piece is opulently scored (SATTBB) and the polyphony is exuberant; indeed, the writing is virtuosic. The piece is very spirited and so is this performance. I was interested to read that though the recording was published in 1991 and Peter Phillips thinks highly of the piece he has not since had a chance to include it in a Tallis Scholars concert programme. Like Isaac, Josquin Des Pres was Flemish but Peter Phillips describes their respective music as “a kind of chalk and cheese”. Josquin’s Missa Ave maris stella has its exciting, extrovert moments but for the most part it’s more reflective than Optime pastor. It’s a succinct setting – both the Gloria and Credo are remarkably concise – and the scoring (SATB) is on a fairly modest scale. Peter Phillips expresses the view that this is a piece that ought to be in the standard repertoire. I don’t disagree, though if it were to achieve that status I suspect you’d still need to go a long way to encounter a performance that displays the same assurance and technical mastery that Phillips and The Tallis Scholars display here. The dates on which the various recordings took place are not specified but the earliest was published in 1987 and the most recent – the Mouton - in 2012. The recorded sound is excellent throughout and though three separate recording locations are represented here the results seem remarkably consistent to me. Largely that’s due to the sort of sound that Phillips has always sought to obtain from his singers. But I’m sure the fact that over the years Gimell have put their trust in only a few very expert engineers has also helped enormously. All the recordings here are the work of either Philip Hobbs or Mike Clements, the latter working sometimes in partnership with Mike Hatch. The documentation, as usual with this label, is clear and comprehensive. This compilation consists of back catalogue but that’s reflected in the advantageous price. Even collectors who have several Tallis Scholars CDs in their collection may well find something new to tempt them here – as I did in the case of the Isaac piece. If you’re coming fresh to Renaissance polyphony or to the work of this excellent ensemble then this new set is an ideal place to start. However, be warned: the purchase of Tallis Scholars recordings soon becomes addictive.